Let the Labor Day be known by plastering the streets or the online media vehicle of the given event posters and flyers. Whether it be for party, events and marketing promotions. The use of design can easily reach your potential target audience and increase frequency on your end. In our list down below, is a collection of poster & flyer templates which will be of great use for design projects be it design prototypes, presentations and so on. You may also go through our list of Labor Day banners to go with advertising and marketing collaterals. 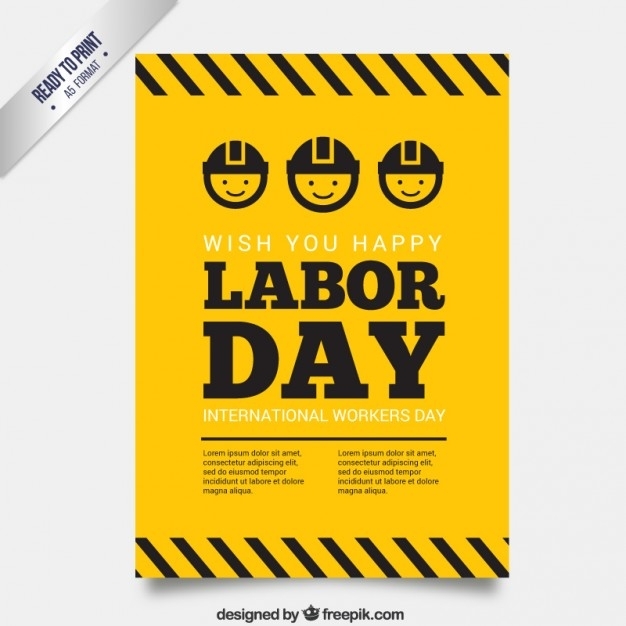 If you wish to use a bold yet simple flyer, the Yellow Labor Day Poster is a design to consider for utilization. It already has been set in with a message and sufficient space for the placement of the design and technical elements. This poster is ready to print and is available in a A5 file size. A perfect way to celebrate Labor Day is by reveling the long hauls away. Invite potential guests through the use of flyers. 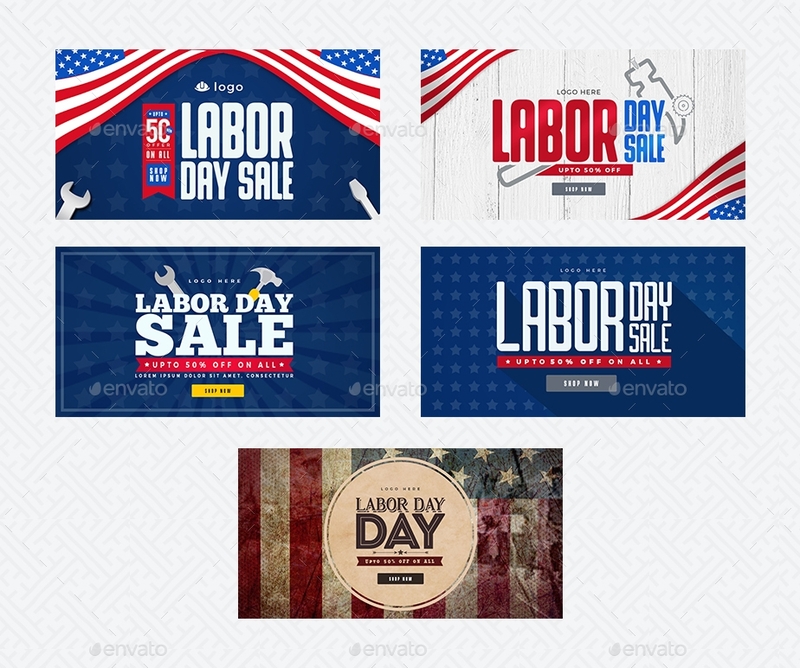 The Labor Day Promotional Flyer uses plenty of bold typographical elements which refers to its type of layout; big type layout. The use of images presents the main live performance for the event which is often used for some promotional collaterals. For a realistic demonstration on given event, the Labor Day Food & Music Flyer is the perfect choice for such selection. 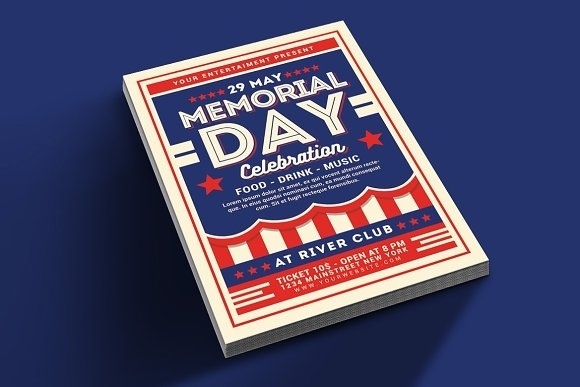 The flyer design gives importance on the event name and event description which gives the viewers an immediate response towards the promotional and advertising collateral. The use of varying textures in fabrics, materials and glossiness brings about a balance in the grittiness of the dominating use of imagery. A commonly used urban term “Work Hard, Play Hard” best represents the whole concept of the design. The use of rigid textures for the main elements exudes strength while the subject brings about playfulness. This flyer design gives emphasis on the imagery and big type layout as means to attract and grab the viewer’s attention without leaving any of the other equally important details behind. 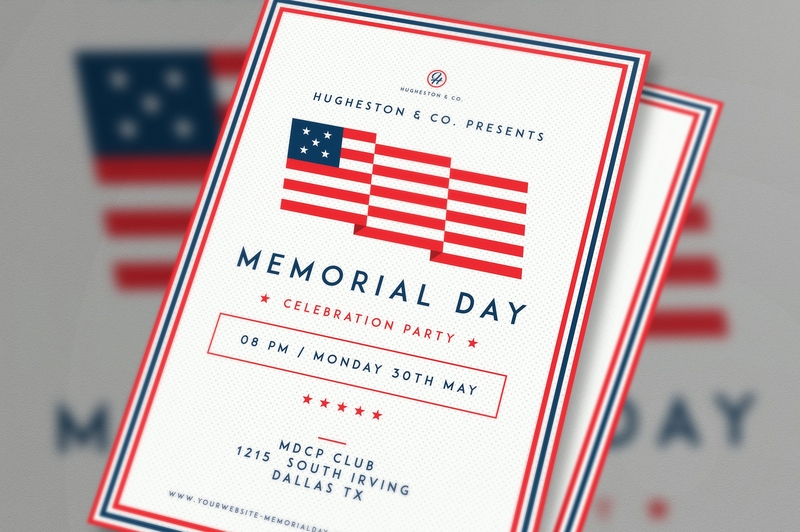 The Labor Day flyer for Parties & Events serves a dynamic and geometric exterior with the dramatic folds of the American flag and textured strokes cleverly placed on the rest of the space. It demonstrates a patriotic emotion with the help of the dominant use of receding colors. 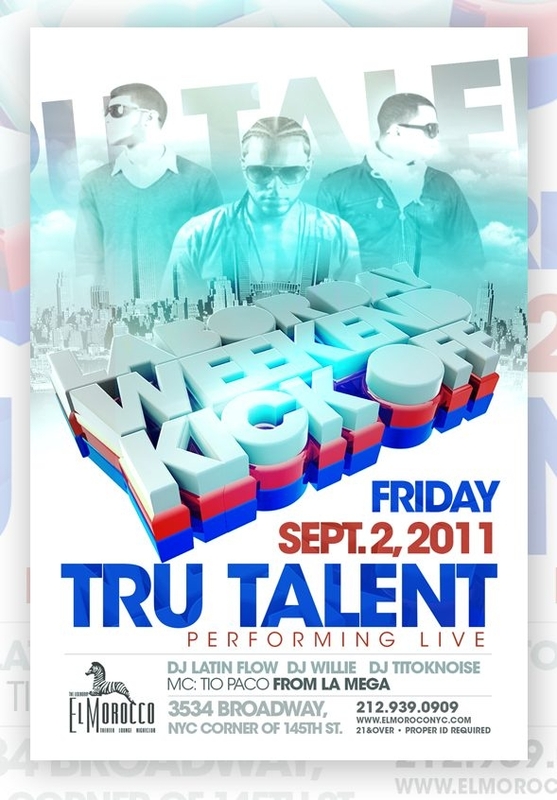 This flyer design comes along with an organized layers for an easy breezy customization. As well as it is in CMYK color mode, which is print ready. A formal and easily recognizable showcase of the American culture and history with the use of stripes and colors. The design elements all receive a cohesive distribution of the creative direction. In terms of customization, the flyer template is layered for easy application. The flyer is set in an A4 size and comes along with a high-resolution file of 300dpi. 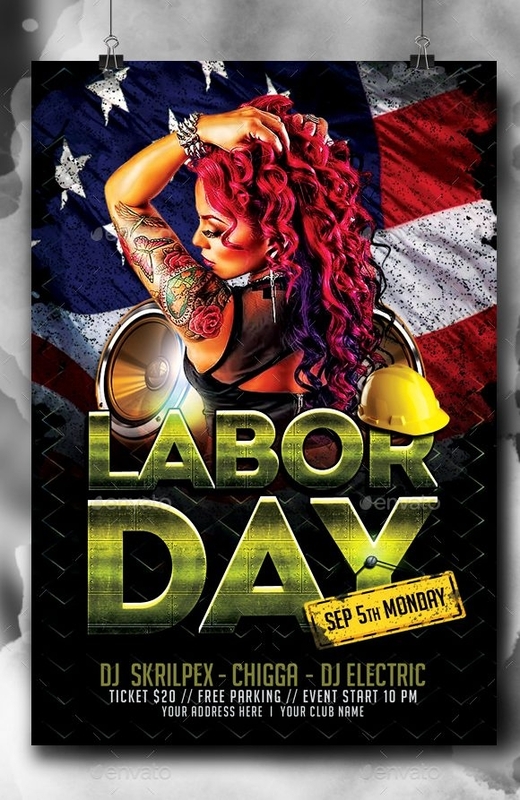 For a fun and amusing flyer design, the Labor Day Celebratory Flyer is a great selection. It demonstrates boldness through the use of thick weighted type; playfulness through the application of several shapes. This celebratory flyer is set in an A4 size that is with bleeds as well as with organized layers easy editing. This specific flyer is print ready with its high-resolution file format in 300dpi which is perfect for small prints. This pack comes along with five variations of its designs for various social media sites be it Instagram, Facebook, Twitter and so on. If your brand’s demographics are to be reached through the use of social media, these banners will help in bringing reach and frequency to conveying the brand’s message. 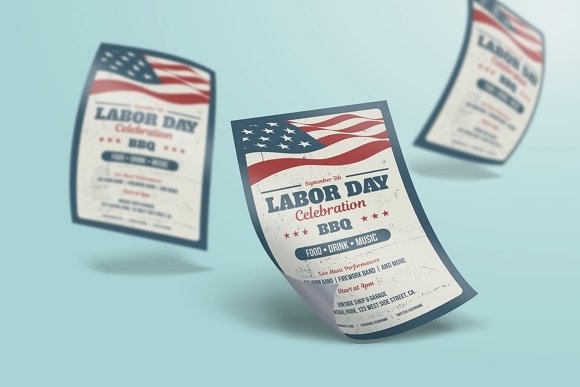 For an organized flyer design, the Patriotic Labor Day Flyer & Poster Template offers just that. With the basic labor day colors of red, white and blue are all equally distributed onto various design elements to create a cohesive design. 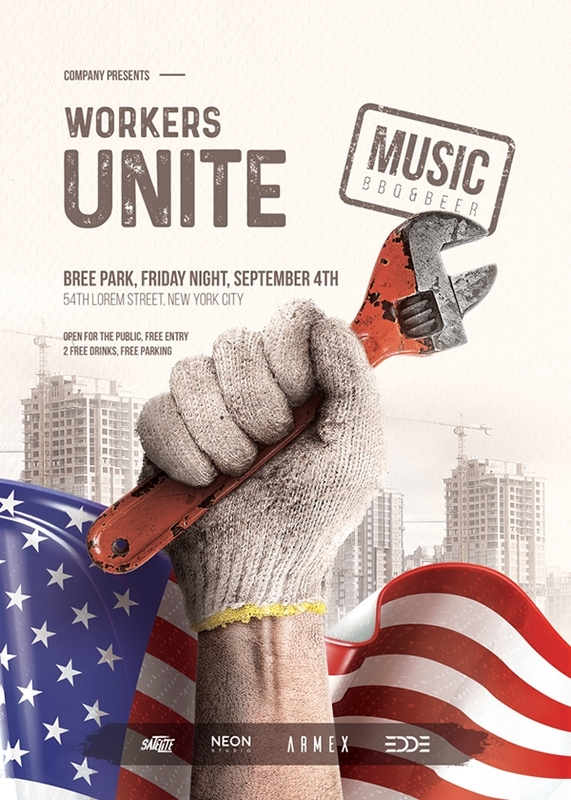 Celebrate the Labor Day with this food, drink and music flyer. But you may customize the flyer to your own design preference or adjust the text accordingly also with ease since it comes with an organized layers. This specific template is set in an A4 size, a paper size commonly used for flyers & posters and is CMYK print ready. Stripes and geometric shapes creates a great outcome for the design. It still brings the playfulness of the event contrasting that with the very core for celebration. To note that with the type of layout it is designed, the technical elements such as event descriptor, event details and call to action are distributed in an organized manner. 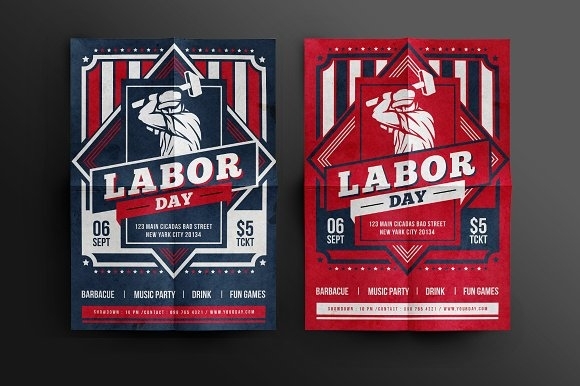 This set of labor day flyers comes in two color variations differing in the use of dominant color. If you are to consider on adjusting the design and technical elements, it will be a breeze from there since the design is set with organized layers. This flyer is also CMYK print ready. For the Labor Day celebration, we have more designs in store for you. If you happen to like showcasing a variety of things on print, you may go through our list of Labor Day Labels. A great selection for personalization, branding and event collaterals.